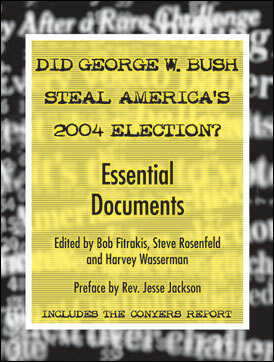 This comprehensive, uniquely powerful collection of as-it-happened breaking news analysis, critical legal documents, official correspondence, sworn statements from Ohio voters, Congressional testimony, statistical analysis, comprehensive polling data, and much more, will stand as the definitive compilation of hard evidence in evaluating what really happened during Ohio’s bitterly contested presidential election, 2004. For those who really seek to understand what has happened to American democracy, it is the first must-have document of the new millennium, and it will shape the historic record for decades to come. Forward by Rev. Jesse Jackson. Includes full text of pivotal Congressional investigative report from Rep. John Conyers, with supporting correspondence. Also includes historic January 5, 2005, letter from Sen. Barbara Boxer confirming her decision to challenge Ohio’s Electoral College delegation in the first Joint House-Senate Session of its kind. Plus threatening correspondence from Ohio Secretary of State J. Kenneth Blackwell and transcribed interviews from Ohio election officials, observers, attorneys and more.